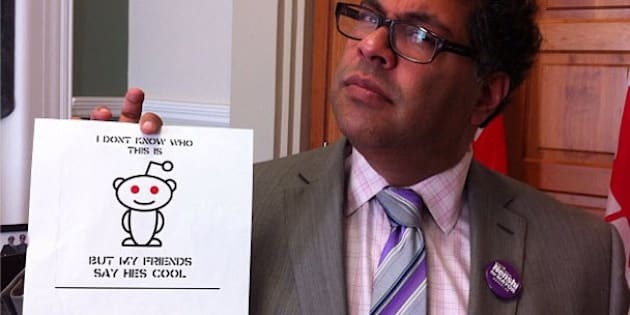 Calgary Mayor Naheed Nenshi took to Reddit Thursday night, sitting down to answer questions on his first ever 'Ask Me Anything' (AMA) forum. The site's users flooded the Calgary sub-page with hundreds of questions before the AMA started, wanting to know the Mayor's plans for future transit developments, taxi cab regulation, secondary suites, and number of representatives on council, among other things. Following in the footsteps of Chris Hadfield, Justin Trudeau, Snoop Lion and others before him, Nenshi, who has made headlines for his social media savvy, spent the one hour Q and A candidly replying to questions -- often employing his quick sense of humour. When asked about the possibility of increasing the number of aldermen to serve Calgary, he joked, " Geez, it’s hard enough having to deal with 14 as it is!" before getting serious, saying the city will soon have to make a "tough political decision" and increase the budgets for aldermen to "make sure they have the support they need." As far as transit plans for the future, Nenshi said that while he is open to exploring 24-hour C-Train service he doesn't believe the demand for it is quite there, citing low ridership during the wee hours when the trains run overnight during Stampede. He also agreed with one reader's suggestion of distance or zone-based fares for transit users -- a departure from the current standard fare for all riders -- going one step further to suggest fares could be based on income. "I think ultimately fares should be about fairness - and we should think more about how transit fares relate to income and the ability to pay (as with access to other City services as well)," he wrote. When questioned about the possibility of a southeast LRT line Nenshi said that while no set plan is in place, a "Green Line" would stretch from the north end of Calgary (Stoney Trail and Harvest Hills Blvd) to the new south hospital. For now, however, he says there is no money for this project, which would cost about $5 billion. As far as the upcoming municipal election, it's clear Nenshi is nervous about the outcome -- although more so for who he will sit alongside on council should he be reelected. "I am worried that, in the new term, we may have some council members who are driven by ideology rather than by ideas, and who won't listen to proposals if they are brought forward by ideological "enemies". Of course I will work with whomever is elected (if I am re-elected) but this could make life very challenging." Nenshi also said that in order to have more secondary suites legalized across the city "we need a new council," adding that he was one vote short on the current council and that two of the opponents are retiring. "Ironically, the home builders agree with secondary suites legalization, so if their anti-me slate is elected, I may get a major policy victory. But I'm not holding my breath," he added. Calgary cyclists will be happy to hear the city is planning more bike lane infrastructure in the downtown core after the success of the 7th Street bike track, adding more routes will be added around the city once a plan is developed next year. The question of the night and AMA winner was The-waiting-game, who asked the Mayor "Would you rather fight 100 duck-sized horses or one horse-sized duck?" referencing the same question posed to President Barack Obama during an AMA last year. "The premise of the question is incorrect, I believe. We need to make peace with the duck-horses. (But not the horse-ducks. They're jerks.)" Calgary goes to the polls Oct. 21. Click over to Reddit to see the entirety of Nenshi's answers.